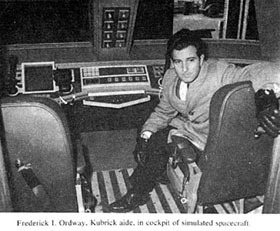 Frederick Ordway was a space scientist and well-known author of visionary books on spaceflight. Ordway was in charge of space systems information at the Marshall Space Flight Center from 1960 to 1963 and before that performed a similar function for the Army Ballistic Missile Agency. For many years he was a professor at the University of Alabama's School of Graduate Studies and Research. However, his greatest contribution has been to the popularization of space travel through dozens of books that he has authored or coauthored. He was also technical consultant to the film 2001: A Space Odyssey and owns a large collection of original paintings depicting astronautical themes. Ordway was educated at Harvard and completed several years of graduate study at the University of Paris and other universities in Europe.